As has been explained earlier on my post about html as standar language to create web page that the html document consists of tags to describe information in a web browser. 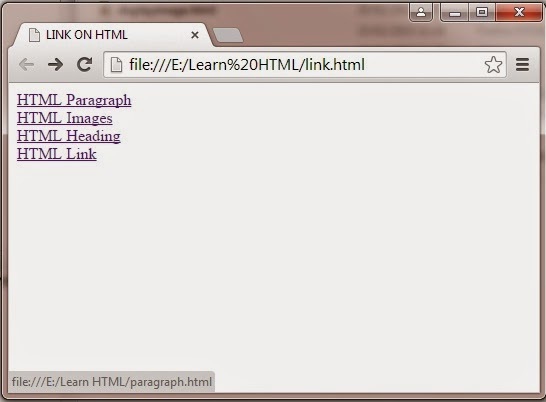 This session will describe the use of some html tags and attribut on the html document. Tag on html documents useful to tell the web browser what the function of a text which web browser will translate it in a web interface. The example above is the standard for writing tag <p>. For writing a paragraph in html we can set text align for the text in the paragraph, but an earlier will be describe about the attributes first. To set text align in the paragraph, the attributes used are align by giving a value on the align attribute. The value that can be given to the align attribute which is "left" for text align left, "right" text align right, "justify" text align left and right and "center" for text align center. To display the text indented into the first line of the paragraph we use the attribute style. The value of the attribute style is CSS (Cascading Style sheets), but CSS is not explained in depth in this article. CSS here are only as an example just to display the first line of text is indented into the paragraph. Break Row is used to create and move the position of writing to the new line. In HTML, to create and move to the next line are using the tag <br />. The function of this tag is the same as we hit the enter key on the keyboard when we type using the word processing application. This is the first line.<br />This is the second line.<br />This is the third line. Images on a web pages are very important as an attraction for visitors. Imagine if a website is not showing any picture and shows only text, surely will look less attractive. In addition to interest, the images on the website are also useful to help visitors to understanding the information or content displayed on the website, with a note that the images displayed are related to the content of the website. 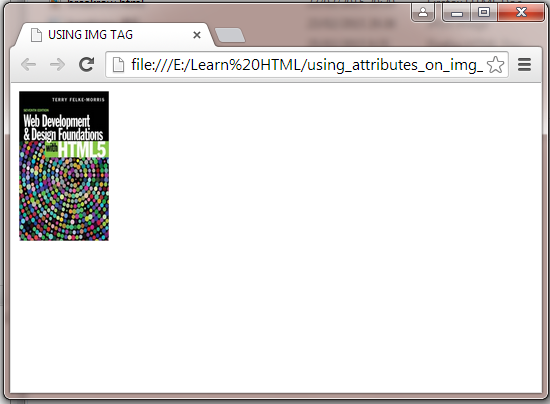 To display image on web browser using html, the tag used is <img>. In the following example, I prepare an image file placed one folder with html file that will display the image. Note this code <img src="htmlbook.jpg" /> on above html document. The attribute src of the tag gives information on the filename of the image that will be shown, or more precisely the address of the image file is located. In addition of src there are some attributes that can be used on a tag <img> with different functions, i.e. width to set the width of the image, height to set the height of the image, the alt to provide information if the image is fail displayed by a web browser, and align to set the images alignment to the text. Headings are a set of words that make up a phrase which is the title or subtitle in a html document. Heading has a size that varies depending on the level that is defined. 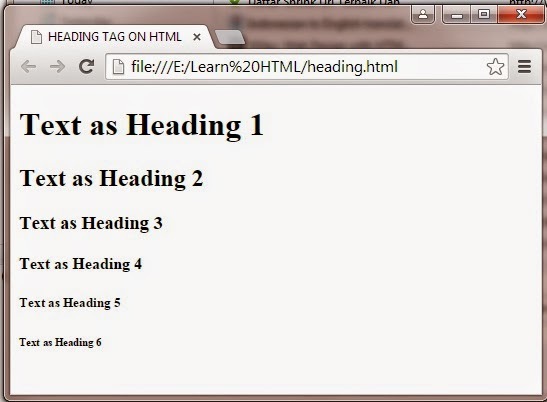 Headings in html has a level 1 to level 6 are defined with the tag <h1></h1> to <h6></h6>. On the above code will showing the text heading between h1 to h6 on your web browser. Look at the image below as the appearance of above html code on the web browser. The meaning of text formatting on this section is modifying the text display using HTML. Text formatting that will be covered include font size, font type, font color, text alignment, text with bold, italics and underlining. To make the bold text the tag used was <b> as opening tag and the closing tag </b>, the other the opening tag <i> followed by text as the element of this tag then close by closing tag </i> will make the text or elements of this tag in italic style format. Other than that has been mentioned, to underlining the text, we are using the tag <u> followed by elements then closed using </u>. 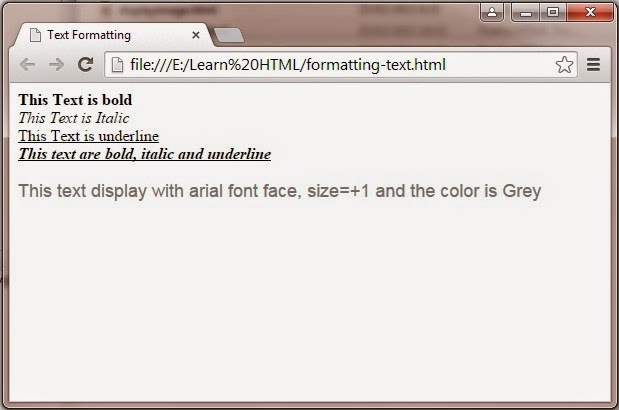 Take your self to the code below as the example to make text bold, italic and underline. List on html is grouped items are structured either sequentially with numbering or not. On html there are known 3 methods in making a list that are ordered list, unordered list and definition list. Unordered List is a grouping of items that have no specific order. Similar to ordered list, but the unordered list are using the opening tag <ul> and close by </ul>. Look and understand the html code below to create the list using unordered list method. HTML as the standard language for creating a web page is very important to understand when we want to learn more about web programming. Learn HTML language is so much fun when we tried the examples of code that is later learned to understand by looking at what has appeared in the web browser. That's some tags and attributes on html as example. 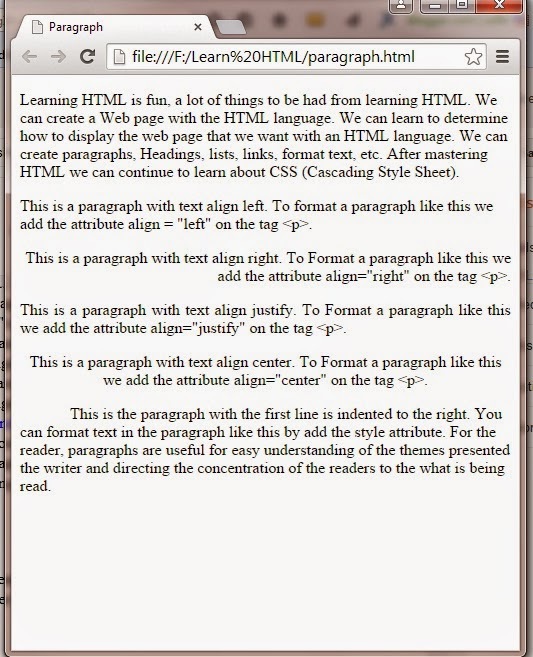 Hope will help you to learn html language from basic. You can found more html tutorial at this site by type the keyword that will you search at the search box on the right at this site.